LED grow lights are becoming an increasingly popular choice for people growing plants indoors. The Viparspectra 300W LED grow light is an impressive package, providing excellent value and great performance for indoor gardeners. I’ve used this light personally over the last 6 months and have been very impressed by the light’s performance and the growth of the plants. It’s a grow light that will be best suited to beginners and intermediate growers, but is a great option to get started with LED grow lights. I’ve gone into quite a bit of depth in this article, but i’ll start with a summary of the features and the pros and cons, for those with a bit less time to spare. Who Is The Viparspectra 300W Best Suited For? The Viparspectra 300W LED grow light is quite a small unit, but is well equipped with 60 high intensity 5W LEDs that are suitable for all stages of plant growth. It will suit someone looking for a general purpose grow light, and is less suited to an advanced grower with very particular needs. The unit is targeted at beginner and intermediate growers, and is pitched at a very competitive price. General feedback on results and reliability has been very good, and I think this would be an excellent option for a lot of people. Those with a small or mid-sized growing area. People looking for a good grow light without having to spend a fortune. People growing 2-4 plants at a time. Viparspectra produce a range of similar grow lights at different sizes and outputs. They also have models with built in timers and dimmers, but these are more expensive. The larger models within the reflector series are listed below. I would have to say I was fairly impressed with the construction of this LED grow light. It feels solid, worked without any issues, and has given me no trouble over the last few months. I also like the sleek design and it looks well in my growing area. I was a little skeptical about purchasing this grow light as it is towards the value end of the market. I was aware that there are some cheap LED grow lights on the market that are absolutely not worth buying. However, I was generally impressed by the performance of this grow light. For anyone growing small numbers of plants and is on a budget, I think you will find the Viparspectra 300W to be an excellent option. You do need to be quite careful when purchasing an LED grow light, as there are numerous budget models which will not provide satisfactory performance. Equally, top of the range models can be considerably more expensive, and are likely to be more than a novice or intermediate indoor gardener may want to spend. Thankfully, LED grow lights output significantly less heat that HID lights, and are generally more effective that fluorescent grow lights. As a result, you get the best of both worlds. While they do run much cooler, LED grow lights do still output some heat, so there is a built in fan to dissipate this heat. The fan is pretty quiet, certainly no louder than an average desk fan. The vented heat shouldn’t cause any issues, unless you are growing plants in a very small, enclosed grow tent. One point to note, is that the maximum operating temperature is 104°F (40°C). I can’t see this being an issue, as you wouldn’t be doing much to help your plants if you let your grow area get up this high, but it may be an issue to monitor for those in hot climates or with a growing area prone to accumulating heat. One of the many reasons growers are increasingly shunning HID grow lights, and moving over the LEDs is the increased efficiency of LEDs. Although LED grow lights remain quite expensive to purchase, the lifetime running costs will be much less than a comparable HID light and will result in a lower cost over time. As for fluorescent grow lights, unless you are only dipping your toe in the water with growing plants indoors, and trying to keep costs as low as possible, I would definitely recommend you take the plunge with an LED grow light. The reason is that LED grow lights will produce much better plant growth and yields and much greater satisfaction for you over the long term. 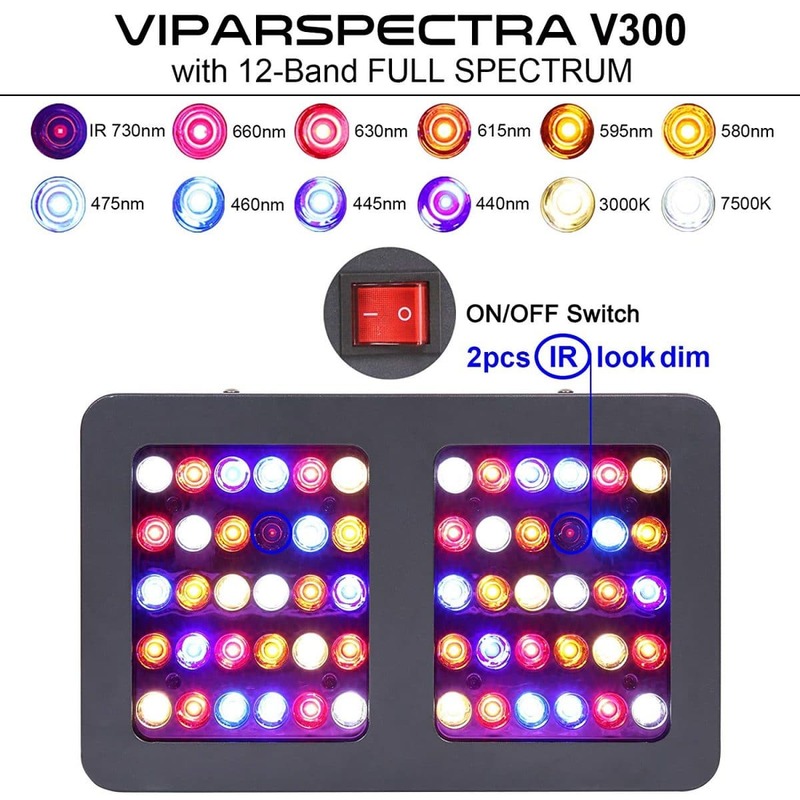 One thing I find a bit irritating is that Viparspectra use 300W in the product name of this grow light, as the unit does not output anywhere near this. It does have 60 5W LEDs in the unit, but the entire power draw of the unit is only approx 136 watts. It could lead to some people making incorrect purchasing decisions and buying a grow light that is less powerful than their needs. You’re unlikely to notice much change in your power bill with this grow light, and it’s reassuring to know that you will be using one of the most energy efficient grow light technologies. I really like the fact that this grow light is so easily expandable. Each unit has a daisy chain outlet, which allows you to use the power cord of a second unit, to link the two together. This grow light is small and designed for beginner and intermediate users, but you can easily buy further lights to expand your grow area. The daisy chain connector means you can simply plug in another light and you’re good to go. It keeps your setup simple and you won’t have power cords running everywhere. When comparing the price of the Viparspectra 300W, to the larger models in the same range, it can sometimes work out cheaper to get two smaller units, instead of one larger unit. This was reassuring for me, as I may well expand my setup over time, and it’s nice to know that I can do this cost effectively. Fair enough, the larger units have a few extra features, most notably separate veg and bloom switches. Without this feature, you are most likely limiting the growth and yield potential of your plants, but I’m happy to keep things simple and affordable for now. This is a fairly small grow light and will do a good job of providing light to a 2×2 foot growing area. In the flowering stage, where the light will be closer, at approx 15 to 20 inches, it will only cover 1.5×1.5 feet of growing area. This isn’t a huge area, so if your growing area is larger than this, you may want to consider getting two, or opting for one of the larger models. This is what I have found to be the best, but does differ slightly from what the manufacturer suggests. The light intensity, or more specifically, the PAR output of a grow light is crucially important to consider when choosing a grow light. You must ensure that you have sufficient light output to maximize the growth of your plants. The PAR output from the Viparspectra W300 is shown below. As you can see, the output pretty reasonable, but is really only suitable for a small growing area, of about 2ft by 2ft. The light output isn’t going to match some of the premium LED grow lights on the market, but then, you’ll have to pay a lot more to buy those. I reckon this light will do the job for the majority of hobby growers at home. I certainly don’t regret my purchase and have seen very good results. One thing that isn’t mentioned very often when people talk about LED grow lights is the color of the light itself. If you are used to the fresh white light of fluorescent grow lights or the warm glow of HID lights, the purple hue from many LED grow lights will be a bit of a change. I’ll be honest and say that this is quite an off-putting feature for me. Previously, I used to have my grow area in a room off my kitchen, but I really disliked the purple glow emanating from these lights, so I’ve moved my growing setup to the garage. For sure, many people wont care about this, or will use a grow tent or a grow room away from other parts of your house, but for me, it is a definite negative. 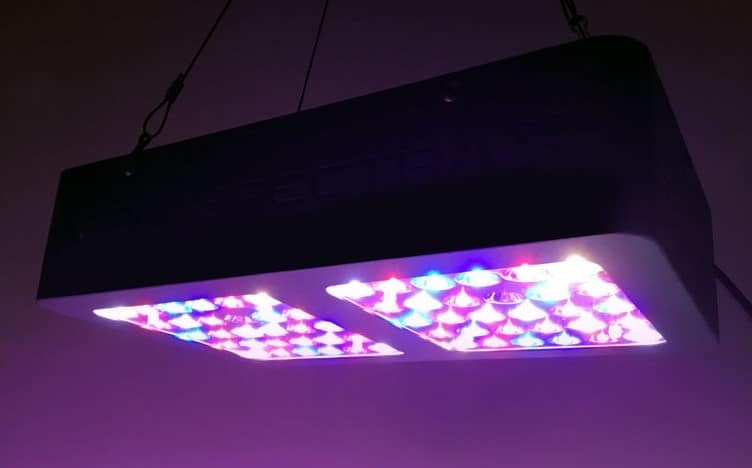 There appears to be a growing body of evidence that wide spectrum white LEDs are probably as effective for growing plants than the more commonly used red-blue spectrum LEDs most commonly sold today. This is probably the only significant factor that may make me choose a different brand of LED grow light for my next purchase, but I have a bit more research to do. The green sunshine company do some great wideband LED grow lights, but the price makes the eyes water a little. The light from the Viparspectra W300 is a nice mix of red and blue light and I was pleased that it covered the full spectrum. It generally stayed very quiet and cool and I thought the look of the unit was really good. I’m delighted with the efficiency of the unit, with power requirements being very reasonable. I found my plants had great leaf and stem growth and excellent flower development. I’ve used it for growing both leafy greens and vegetables, and the performance has greatly exceeded my previous performance using fluorescent grow lights. I will certainly be sticking with LED grow lights from now on. 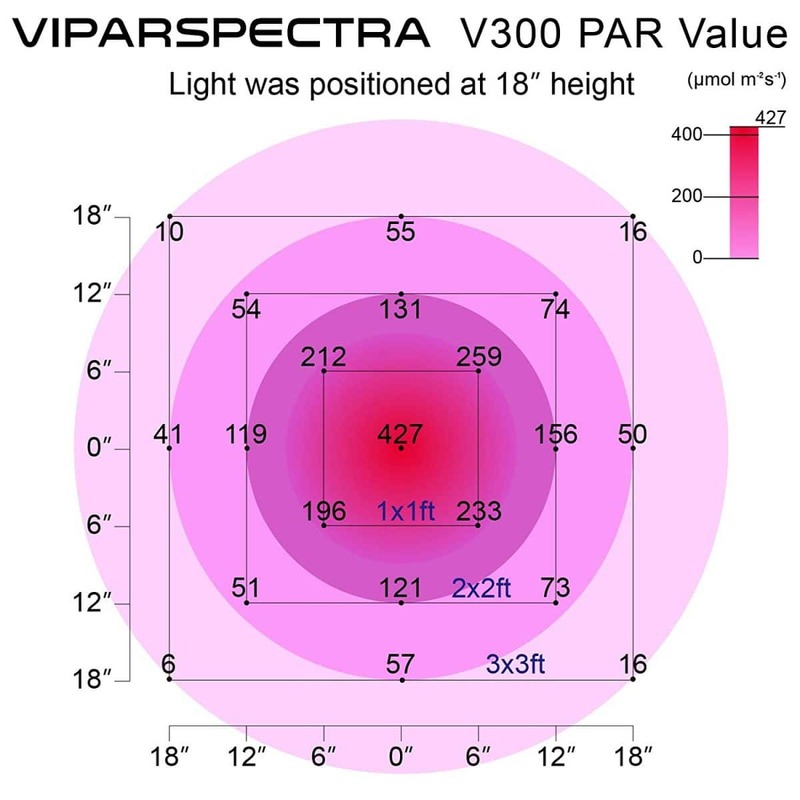 I feel the Viparspectra range hits a sweet spot in terms of price and functionality, and I think I’ll be expanding my growing area with further lights from the range in the future. 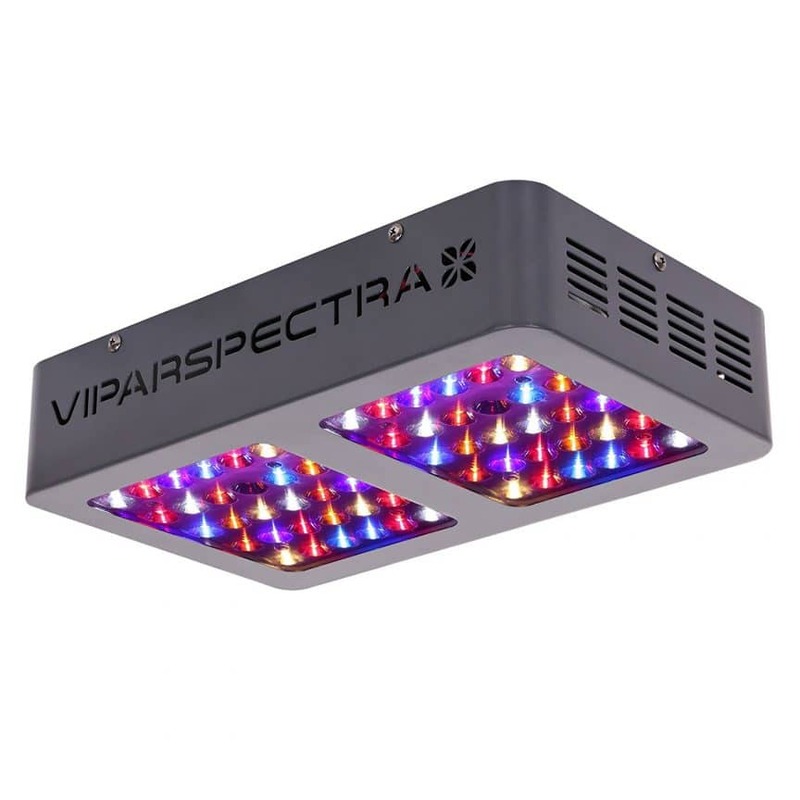 Viparspectra sell this grow light with a 3 year local warranty and a 30 day satisfaction or return guarantee. Most people report this unit to be very reliable, which isn’t surprising considering the underlying reliability improvements that LED technology has over other types of grow light. With an average lifetime for the LEDs of 100000 use, it’s likely you’ll get many years of productive use from this light. I’d love to know your thoughts about this grow light or your experiences if you already an owner. What do you guys think about red-blue LED grow lights versus white, wide spectrum LED grow lights? Leave a comment and let me know what you think. Can You Grow Plants Without Sunlight?